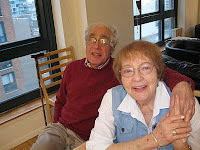 We Hermans have hit a bump in the road and for the last few days, I’ve been writing a different type of blog, providing updates about my mother’s health status to my parents’ large and loving network of friends and family. We all are incredibly touched by the outpouring of affection, care, concern and, most important, good wishes for healing. Please continue to keep my mother in your thoughts and prayers for a refuah shleimah – a speedy and complete recovery. It means a lot to her and to the rest of us.